There is a lot of effects that fall under the “modulation” category on the ground that they send your tone swirling or oscillating. In this series of posts, I will try to unravel the mysteries of effects such as phaser, flanger, chorus, leslie/univibe, vibrato or tremolo. These effects, if used well, can spice up your rythm work or make your lead tone fatter to name only two of their magical powers. I will not go into too much details about the electronics behind these effects but will focus on their characters and uses for us, guitarists. Videos are included to stir up your inspiration. In this first part, I will present one of the oldest modulation effects: the Phaser also known as Phasing or Phase-Shifting. The first thing I should clear up is the difference between phaser and flanger as I often see in forums that people get confused. Phasing is created by using a series of filters (all pass filters) associated with an oscillator whereas flanger is created by using a very short delay. I am over simplifying here but know that they do sound different. Phasing tends to sound a little “crazier” and has no real equivalent in the real world. Flanging, on the other hand, sounds like a jet plane taking off and is akin to a real world sound effect known as “Doppler”. I will write about flanging in part 2 and focus on phasing in this post. For those of you wanting to know more about the science and the electronics behind our beloved phaser pedals, have a look at this wikipedia page. The phaser effect is used in almost every genre but some are more phaser friendly than others. Used with a non distorted clean tone, it is for instance very popular in reggae: listen to the solo of “No Woman No Cry” on the live at the Lyceum by Bob Marley for a prime example of phased guitar. Funk is also a genre where phasing is king. It enhances rhythm licks and can be an alternative to a Wah (although they are two different things). When it comes to big rock tones, Brian May of Queen and of course Eddie Van Halen are big phaser users. The first Van Halen album is almost a demo of the MXR Phase 90, listen to the Intro of “Atomic Punk” or “Ain’t Talking about Love” and you’ll know what I mean. You will find information about other models after the videos below but I have decided to present and demonstrate the MXR Phase 90 first. This little orange pedal is to phasers what the Tube Screamer is to overdrives: the standard. I have recently acquired a vintage phase 90 and I must say the hype is not unfounded. It is really warm and although it has only one setting (“speed”), you can get a lot of different sounds out of it. With the speed setting between 10 o’clock to 12, it goes straight into Van Halen territory whereas at higher speeds, around 2 o’clock, it is reminiscent of some tones Hendrix got with his univibe pedal. If you are in the market for a Phase 90, it can get confusing as there are several models to choose from. The very first 1970s unit had no LED and “Phase 90” was written using a type of “handwriting” imitation. Thus, these pedals are nicknamed “Script”. Around the end of the 70s, the lettering changed to capital letters and these models are nicknamed “Block”. The sound did not change much between these two early versions though. MXR went bust in the 80s and the brand was resuscitated by Dunlop. No less than three versions of the Phase 90 are currently manufactured by MXR. The entry model, orange with a LED and “Block Lettering” is the most affordable. The thing is it does not sound quite like the old stuff and tends to provide a more “pronounced”, less subtle phasing effect. In order to address these issues, MXR also sells a reissue model which sports a “Script” logo and has no LED or external power plug. It does sound more subtle and is closer to the old 70s models. The third model in the range, the Eddie Van Halen or EVH Phase 90 has a little switch to go from a modern “Block” tone to a more subtle vintage “Script” sound. A fourth custom shop model was sold until recently, it was orange, with Script lettering and a led and its model number is CSP-101. People who have opened it apparently found out that it was an EVH model without the block/script switch which seems quite redundant to me and might explain why it seems difficult to find it anywhere. For a sound comparison between the entry level “Block” Phase 90 and the Custom Shop “Script” model, have a look at this video by gearmanndude. Here are three videos showing my Vintage MXR Phase 90 in action: first clean then placed before the distortion and finally after the distortion. I show different settings in each video and at the end, I add a little delay using my Boss DD-3 to show how it plays with a phaser for an ultra spacious tone. Gear used for the video: Fender American Classics Custom Shop Stratocaster with Kinman AVn Blues pickups, 1974 Fender Champ Amplifier (Volume at 3, Bass at 10, Treble at 2.5). Gear used for the video: Fender American Classics Custom Shop Stratocaster with Kinman AVn Blues pickups, 1974 Fender Champ Amplifier (Volume at 3, Bass at 10, Treble at 2.5), Analogman modded Boss DS1 Distortion (Dist at Max, Tone at 8 o’clock and Level at 10 o’clock). 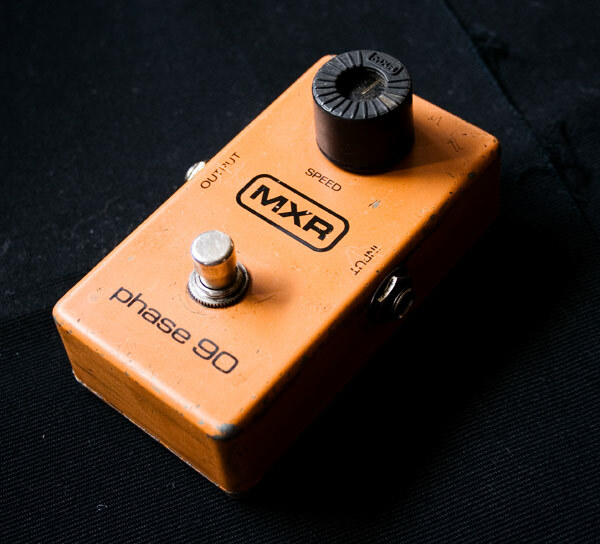 There are other models than the MXR Phase 90 but before you choose a phaser pedal, you have to know that phasers have a certain number of “filter stages” (remember, phasers are built using a series of filters). The number of stages has a great influence on the tone. In some ways, the more stages, the more pronounced the effect. Basic phasers such as the recently reissued MXR Phase 45 have only two stages and they are quite gentle. 4 stage phasers are the most commonly heard on records, uber famous examples are the MXR Phase 90 or the Electro Harmonix Small stone, both used by David Gilmour in the 70s. If you want that classic 70s phaser tone, chances are you will want a 4 stage phaser. Companies like Boss went further with their phasers and the now discontinued PH-2 had 10 or 12 stages depending on the position of its mode button. I own a PH-2 and although it is not a bad phaser, it tends to sound quite out-worldly and I find difficult to use it to reproduce the Van Halen rock tone or the cleaner reggae/ 70s funk tone. The replacement of the PH-2 in the Boss line, named PH-3, is a digital pedal and can emulate the tone of 4, 8, 10 and 12 stage phasers. I haven’t tried it but I gather from various sources that it is versatile if not very warm sounding. The settings on a phaser can go from only one speed button (MXR Phase 90 or 45) which decides how fast the tone “swirls” to three knobs called Depth, Rate an Resonance (Boss models). Depth is the ratio between processed and unprocessed sound, Rate is the speed of the oscillations and Resonance is a setting that allows to take some of the processed signal and send it back to be phased again which creates super crazy effects. There is a bit of a debate as to where to place a phaser in the effect chain. In most multi-effect units, it is placed after the overdrive/distortion stage but I must say that I got very good results by placing my Phase 90 before a distortion as seen in the videos above. As always, experiment! Let’s also not forget that phasing sounds great with keyboards, especially with Fender Rhodes electric piano sounds as well as pads. It even sounds good with bass! If you lend your phaser to your keyboardist or bassist, he/she might not want to give it back, you are warned! On the second hand market, another great model is the Maestro PS-1, good luck to find one. As far as I know there is no clone on the market. Boutique manufacturers have also come up wit great models such as the Retro-sonic Phaser which is an MXR Phase 90 clone with more settings. Let’s also mention the Pigtronix EP1 which is as whacky as it gets. Finally, for those on a budget, the Ibanez PH7 is a good alternative with 4 and 8 stage modes.